Want to be able to fall asleep listening to your music while quality, gentle background noise drowns out distractions? Then you need to try the App Store's premium app for playing background noise along with your personal music. After the music stops, the soothing background noise continues to drown out ambient noise for the rest of the night. Music and Noise focuses on simplicity. Select your playlist or album once, and Music and Noise will remember your selection. Next time, just press Play. Music and Noise has independent volume adjustment for the background noise, so you can create your perfect balance of soothing background noise and music. Set it once, and forget it. Music and noise will automatically remember the volumes for next time. 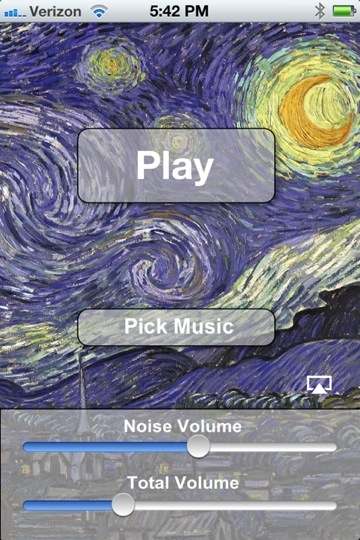 The background noise in Music and Noise is specially formulated for the iPod/iPad/iPhone speakers. Many sounds that might work for background noise on larger speakers sound very harsh and distracting on the smaller speakers of iDevices. The gentle sound of a fan in Music and Noise is specially designed to sooth and drown out a variety of distracting noises. This app was born out of my desire to simplify my baby’s nighttime routine. We would walk into her room, turn the sound machine up to just the right level then turn on her music on the iPod. Music and Noise eliminates the need for a sound machine, by playing the background noise at the same time as the music then continuing to play the background noise to promote a restful night’s sleep. Plays any music in your iPod library along with background noise that continues after the music stops. Click here to listen to a short sample of the background noise to make sure it works for you. As the sound varies device to device, we suggest you click this link on the device that you'll be using most of the time. *Always use Music and Noise at safe volumes and never use headphones with a baby.